It invades – er, pervades – so much of our selves that being stranded on the proverbial desert isle sans our Blackberries and iPhones would force us to rethink who we are. IT allows us to check trends, respond instantly via texting or IM’ing, rsvp to clients and customers, strategize through communities of interest, and just plain do our work. Yet when we hear or read news about the next “killer app,” we cringe. Originally, the phrase referred to any computer program that instantly proved its value (in terms of sales, usually). PageMaker and Adobe, for two, earned that moniker. So did Pokemon and the Halo video game franchise. Other personal “apps” emerge. In many colleagues’ lives, the iPhone’s touch screen rules. For me? thesaurus.com and AdAge’s online edition. When we really think about it, all these examples are, pure and simple, tools that help us succeed. Maybe at one time, before copycat-ism shortened the life of innovations to one nano-second, killer apps existed. Now, Groupon has been circumvented by LivingSocial, opentable.com, and any number of local e-businesses. The iPad is spawning imitators (and good ones, at that) by the day. One site, one product, one service might have served us well in the past. No way today. We’re also objecting to the phrase for deeper reasons. 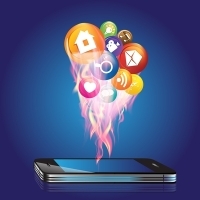 One, killer apps over-emphasize the influence of technology. After all, we find killer apps in other industries, like pop-up shops for retailers. Or the growing call for good greens, from farmers’ markets to companies’ products. Two, the use of killer apps obscures the cry for just plain communications. Too much attention is being paid to screens and animation. Too little, to the needs of the folks around us. When a face-to-face request is usurped in favor of email exchanges and PowerPoints, when we “3-3-7” an important voicemail because there’s another urgent priority, when our eyes peek at business smartphones during a video/audio team meeting, it’s time to give killer apps a rest for a while.